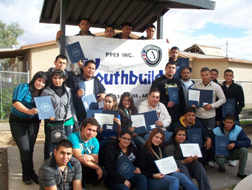 The YouthBuild/AmeriCorps program is located in Yuma County where it serves approximately 24 at-risk youth per year in education and skill development. Students attend GED classes and build affordable housing for low income families through housing partnerships, as well as attend community college courses. Through the AmeriCorps arm of the program, youth are given opportunities to give back to their community through service and earn education scholarships for college. Leadership development and civic engagement are strong components of the program. YouthBuild is an opportunity to be a part of something that is bigger than you. It is hard work, it is learning, and it is earning your way. YouthBuild makes a difference in all the lives it touches, whether you are the student in the program, the family receiving a new home, or the recipient of a community service activity. It is being part of a community for the greater good of everyone involved and showing that positive change is always possible. It is getting up at 5:00am to be on a job site learning valuable work skills or it is showing up for GED classes at 7:00am. It is leadership development, youth councils, and getting involved in oneself and the community.